First of all, I request viewers to bear with me for being more preferential to Lord Vishnu or Sri Lakshminarayan in my articles, as I am a Vaishnavite. I will be posting about Lord Shiva also in my later posts. So, presently, I am dealing with my Vaishnava sampradayam series of performing puja at home. First, you will render the prayers to Lord Ganesha by chanting "suklam baradharam vishnum" and other hymns on Ganesha. You may view the meanings of suklam baradharam vishnum meaning at this link. Thereafter, chant the Guru stuti or acharya vandanam hymns, paying your respects to the tree of teachers and saints of your creed. You can view these hymns also with their full meanings at this Link. Thereafter, you are required to purify your body and soul by sprinkling water on your head and taking water three times into your mouth chanting some mantra and names of God. This purification is done by chanting the below mentioned Atma shuddhi mantra or verse. baahyabhyah = along with outer, antara = inner, suchihi = (for) cleanliness or purification. Whether pure or impure, or might have passed through all other conditions of life, I am remembering the butterfly-eyed (or lotus-eyed ) God Vishnu, for outer and inner purification. So, you will first recite the above mentioned Atma shuddhi mantra and then sprinkle the drops of water on your head three times from the puja glass or rounded tumbler using your right-hand thumb chanting "pundariikaakshaaya namaha" all the three times as mentioned below. This puja starting mantra is that of performing Aachamanam. This procedure is as follows. You will be keeping pure water at puja place in a glass or tumbler that is to be used only for puja purposes. That container should not be used for other purposes. You will be washing it and filling fresh water daily for puja. A separate new spoon or a spoon-like thing known as uddharini is used for taking water from it for these purposes. Now, after completion of Atma suddhi as mentioned at the above top Atma suddhi verses, you will be performing Achamanam. Three names of God are recited while taking water 3 times into your mouth. Hold your right palm like a bowl and draw the water from the container using the spoon with your left hand and pour it into the bowl-shaped palm and drink the water reciting each name. While drinking the water, you have to take the names of God as follows in the same sequence. First name to be recited is "Om achyutaaya namaha" and drink the water. ( achyutaaya means one who has no perishability or destruction). The second name is "Om anantaaya namaha" and drink water ( anantaaya means one who has no beginning nor ending). The third name is "Om Govindaaya namaha" and drink the water ( Govindaaya means one who is the finder of cows or head of cows). 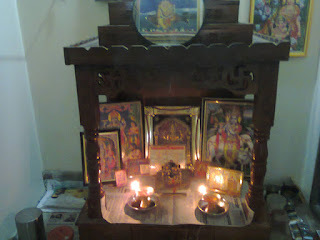 In this way, the Aachamanam is performed before starting puja. Thereafter, you can start the worship with flowers or turmeric mixed rice - which I am dealing with in my next post.